One of my favorite offers to send every Spring is for the wines of Emidio Pepe -- the master producer of singular, expressive, totally natural and, well, totally amazing wines in Abruzzo. From the fresher, tightly-wound, and weighty Pecorino, to the savory, smoky, shape-shifting Trebbiano, to the deeply earthy and infinitely compelling Montepulciano, there are few wineries on earth who can provide such a unique experience...period. Sadly, as always is the case with wineries that offer such a treasure-trove of older vintages, the cellar has, in the last few years, become 'a lot less deep' (to quote my rep from the importer). 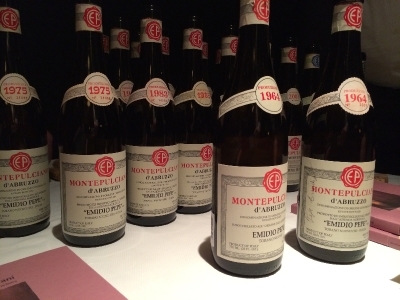 So, not only are quantities available in even more limited quantities than they have been in the past, but this also signals that the older vintages will begin to be truly scarce going forward. Sure, there will (hopefully) always be the new-release wines, but the joys of tasting a fully mature bottle will require decades of patience. Today's offer includes some wines that are arriving in the next week as well as more that will arrive in about a month's time. If you have specific questions about vintages, please ping me back.